Rajon Rondo scored right at the buzzer to hand the Los Angeles Lakers a 129-128 win over his former franchise Boston Celtics. 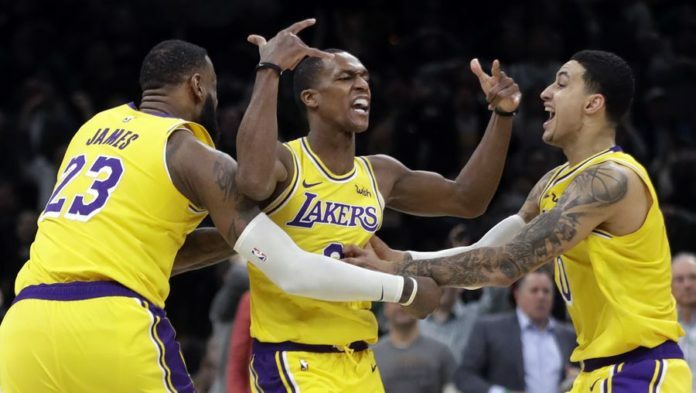 The Lakers staged a comeback in the game, as they were trailing by 18 points at one juncture. LeBron James recorded a triple-double with 28 points, 12 rebounds, and 12 assists as Kyrie Irving had 24 points and 8 assists for the Celtics. The battle was between two teams who will fight for Anthony Davis’s signature in the summer. The Pacers claimed an easy win over the short-handed Clippers, defeating them 116-92. Bojan Bogdanovic top-scored for Indiana with 29 points. Terrence Ross exploded for 32 points off the bench as the Magic defeated the Timberwolves 122-112. Karl-Anthony Towns and Andrew Wiggins combined for 50 points, but it was in vain. Youngsters Fred VanVleet and Pascal Siakam combined for 63 points as the Toronto Raptors won 119-101 against the Atlanta Hawks. Kyle Lowry contributed 13 points and 13 assists, as Kawhi Leonard was given the day off. The Grizzlies, who recently traded Marc Gasol lost meekly to the Thunder, who claimed a 117-95 win. Paul George and Russell Westbrook were again the main perpetrators, as OKC maintained their good run. Meanwhile, the Blazers won against the Spurs, winning 127-118. That’s all the action from today, visit this space tomorrow for more of the same! Next articleBlazing pictures of Paige VanZant! !